I can go to the Tour of California, the Tour de France, one day classics and I never leave having opinions, but when it comes to this race, I find myself running back into the company of the fans to regain my sanity so I can hear talk of who is winning or how awesome Jens is, because really - it's all about the race, isn't it? Then why is the race organization so gosh darn nutso? Believe me when I say to you - Life, is all about people. I love meeting fans from other states. Maybe it is the places where I put myself during a race, but I meet a lot of people from out of state. I am so impressed by these folks who take their vacation time, spend their money and travel to Colorado to see a bike race. Sure this year was special with The Jensie having his last race, but the number of travelers from out of state is fantastic. I strongly believe they change and make the mood of this stage race very special. It is exactly for them that I write my fan guides, well in advance, to help them plan to visit Colorado and have a good time. I love seeing families at this race like the Phinneys and the Stetinas and complete strangers. My family used to have a tradition of meeting at the Solvang time trial in California, staying in a hotel over night, lingering over dinner in Los Olivas the night before and then strolling around the time trial the next day. I love seeing multiple generations at any race, or parents and kids. I like that I often meet Moms and Dads of the racers, I like that parents favorite or retweet my photos of their kids. It feels good. I just wish Eric Zabel had come to America to watch his son Rick Zabel race (BMC). Rick's team won best overall team this year. Connie Carpenter-Phinney is real and would make a nice addition to our table of beer drinkers, Dale Stetina could teach us all a thing or two about race tactics. I really hate it when media channels are abused. Now for a rant. It bugs the crap out of me to meet someone (as I did in Boulder on Sunday) who shows up with cameras strung over shoulder and a blue photo vest and says he is there "for his portfolio." When I ask "Who are you shooting for, " I want to hear for whom and how you intend to promote this race. If you are not getting the word out there to help fans, sponsors or teams, then you are disrespecting this race. The fan behind the barrier who regularly takes photos and knows all the riders and traveled from Texas, has just as much right to be parading around as a photographer as you do. It is just wrong. I fully respect the pecking order of legit photographers and media personnel. I can honestly say that it takes tons of time, energy and experience to report well on a race. The men and women who do it well, need the space and respect to get their job done. There are key personnel in this race, and I do my best to respect them, in the theme of Ivan Basso I have tried to "Start ... from the low level, and go up." I recognize the levels in the media, after four years at this, I have learned a lot but I have much more to learn. I really like photographers Oran Kelly and his full-of-life girlfriend Jo, Darrell Parks, Dean Warren, Kim Hull and her husband Greg Hull, they would be a cool addition at our table of beer drinkers, and they can talk bike racing! No I do not think Boulder is a good place to bring a pro road race. 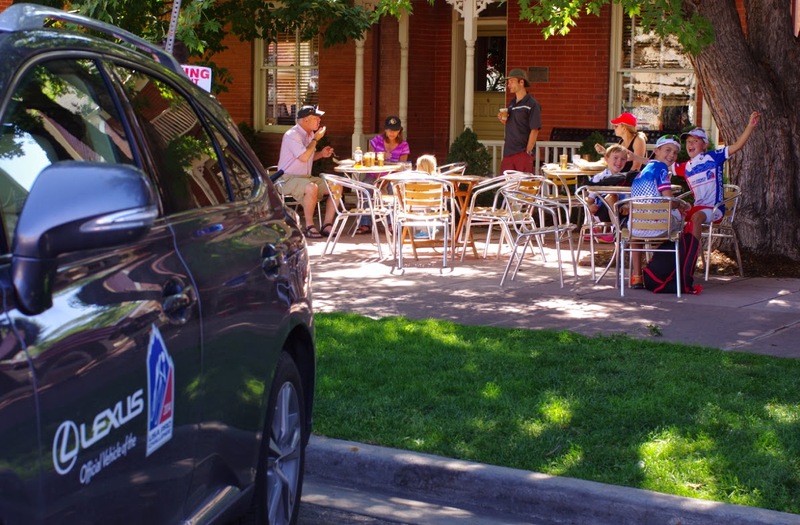 I didn't write a Fan Guide to the stage start in Boulder for a specific reason - the fine citizens of Boulder would not listen to my ideas anyway, they live with pro riders within their borders and think nothing of them. Boulder is a very closed world and they like it that way. I used to work and live in Boulder for brief periods over my twenty-four years in Colorado. Someone, as myself, who has lived internationally and grown up in Los Angeles County is going to feel like a fish out of water in Boulder. Have you heard the phrase, "I couldn't get out of that town fast enough," yep, well that was me Sunday. I swear I witnessed private cars being driven out onto the course in between race laps, I saw people riding their bikes on course and walking across the course -- all while the race was on! If a course marshal attempted to control the disregard for safety, a local would say with ridicule, "Gee she takes her job seriously" and walk across the course in between team cars right in front of her. 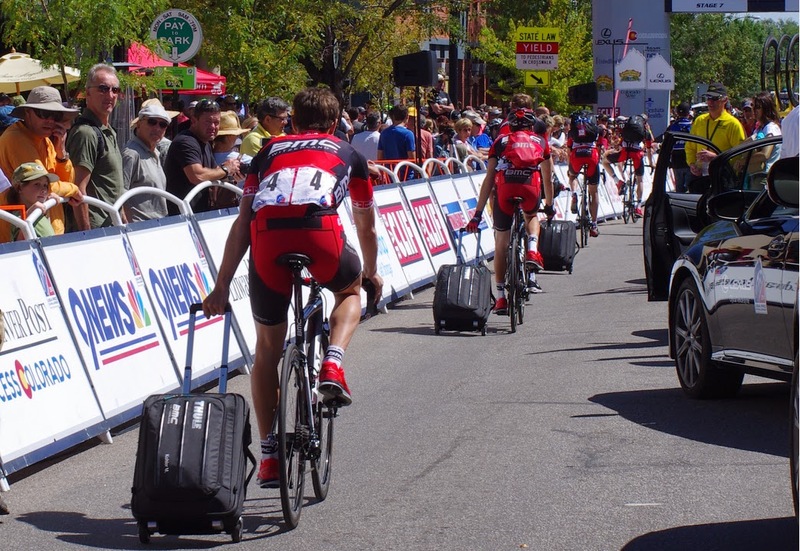 God help us if the USA Pro Challenge returns to Boulder. Cyclocross - whole different story, excellent host city. I like the Schadens a lot! If you ever see Rick or Richard Schaden go up and say hello. They own this race (which is privately funded) and are both approachable and super easy to talk with. I said my personal, "Thank you for this race" to both of them, and each continued the conversation, chatting about real topics of interest. I would love to stand with either of these men along the barricade and talk bike racing. I'd like Richard and Rick to be at our beer table having a beer with us right now. Please get out real information for fans earlier. I understand television coverage trumps race start plans, but tardy information is confusing to fans without clear communication channels. The reason I started creating Fan Guides to the USA Pro Challenge in year one (2011) is because I saw a lack from race organizers. I thought it would improve, it hasn't much. KOM is the marketing company responsible for race guides, which seem to appear a week before the race. I got my race guide on the last day (and I was there all week!). Maps and race times are often incorrect. But KOM is paid to do what they do and are part of the close-knit monopoly of KOM, Medalist Sports and Rogers & Cowan. I am competition and not an insider so there is no way that my services will ever be promoted through this race. I understand that Fans from out of state need to plan vacation days off from work, they need to secure transportation or flights, they want to know how much they will be able to get done in each town and how to travel to and from the stage on race day. Also what else is nearby that they could see while on vacation and maybe meet some fellow fans. It is difficult for me to figure all this out and I live in the state of Colorado! I take my Fan Guides seriously, I want to offer accurate information. ~I need another beer! With all that said, I give high praise to Medalist Sports. I liked the route this year, the riders liked the shorter stages. I think the Commissaires should not have stopped Stage 3, but think Medalist Sports do a fine job of keeping the race flowing with relative safety. A tip for fans in the future -- go directly to the host city websites for help in planning, these towns want you to visit as tourists. My worst nightmare is when I have to step in front of fans to find the gate into the media tent or to get inside the barriers. Why they can't design a path for media better so that fans are not interrupted, I do not know. Fans crowd into every nook and cranny and I despise having to step in front of them even momentarily. The priority is all wrong, I try my darnedest not to block the view of fans who have waited for an hour or more in a prime spot. I am so sorry to anyone that I bumped or crawled past. I will gladly buy a beer for all twelve of those fans who wondered "what the hell is she doing." - you have no idea how many tiers there are in the media hierarchy of access, sometimes I am left to crawl. The miss-information spread for marketing purposes is so unnecessary. We're just not that dumb. CEO Shawn Hunter is number one a salesman and promoter, never forget that. He likes to say that the USA Pro Challenge is second only to the Tour de France, that Colorado has more fans than any other race. That sounds nice, but there is this country called Belgium, that sort of has us beat! Even a cyclo-cross race in Belgium can attract staggering numbers of fans. And then there is Tour of California, Tour of Utah, the tours in Canada, and a little country called Italy. Plus we all saw what Ireland and England could produce in terms of numbers of fans. When I can walk anywhere along the race route and instantly get to the barrier or key spot during any moment of the race - the crowds simply are not that big. Shawn Hunter we are definitely ordering another round (or three) of beers for you. I think the exclusivity of new sponsor Lexus was ridiculous. I like their cars, my Mom drives a Lexus, but I am certain this good company did not intend to tarnish their reputation by being almost cruel to other vendors. Key race staff would not allow other vendors to park their supply vans and cars in the expo area if they were not Lexus. This meant back breaking inconvenience to other paying sponsors. And yet Lexus the company, paid for bike valet free to all fans who rode their bikes into the event - that is good community service. So I am behind Lexus and put the blame on USA Pro Challenge marketing for taking their "partner" sponsorship to the extreme. Lexus because we were able to jam four photographers with all our camera gear plus a driver into one of your (very nice) Media cars, and you care about cyclists - Lexus, I will buy you a beer! I am not a believer that doping has vanished but I do not condone meanness. I really missed Frankie Andreau and Joe Lindsay at the race this year. I asked Nicole Okoneski of Rogers & Cowan (the races representing PR firm), "Where is Bicycling.com this year, why aren't Frankie and Joe here?" "They are covering it from afar," I was briskly told. Oh. That's probably not good, since their from afar consisted of 9 pieces about the race for the entire year (I did 27, VeloNews did 44, CyclingNews completed over 30 pieces). Do you remember last year when I contacted Steve Hill at Steephill.TV to ask him about traffic to his site post race? 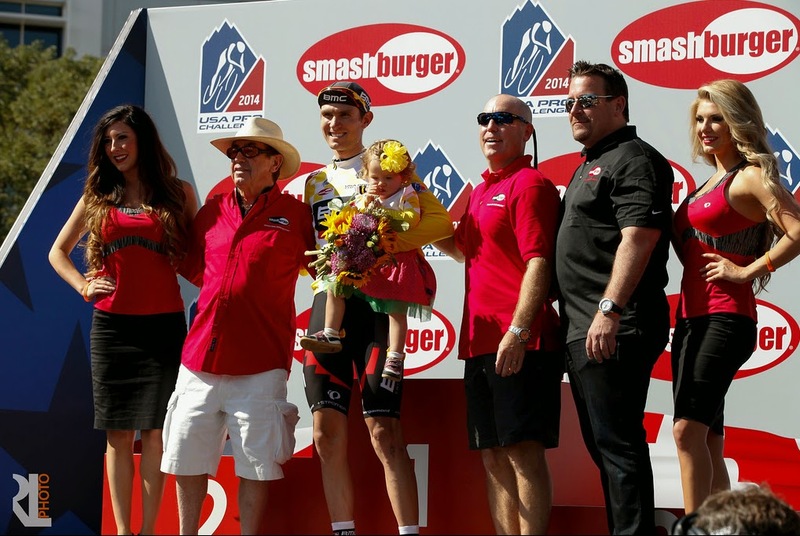 I was (privately) questioning whether the USA Pro Challenge was worth my time. Our stats (percentages, not numbers) were similar in that I got maybe 20% the traffic I received for the Tour of California which is lighter then the grand daddy of them all - Le Tour de France. This year my traffic for August was 80% of July's traffic, that is a good improvement for this race (although July was lighter for me because I was not in France and spent time writing about the Pro Challenge). In past years Joe and Frankie have conducted Tour Talk video race reports similar to the Tour Talk videos with Frankie and James Startt in France. They are good fun to watch and keep the interest going into the next day's stage, but they didn't do it this year. Read Joe Lindsay opinion piece on his Boulder Report blog for Bicycling.com: A Change Is Gonna Come? Tune in for episode 453 of botched neutralizations in pro racing! by Joe Lindsay. I like Joe, I think of Joe as the smart one at our table of beer drinkers. I'd like Neal Rogers (VeloNews) and his lovely wife Whitney to join us for a beer as well. They would have some stories to tell. I like not being tethered to one sponsor. But income would be good. I like that I can promote openly what I think best for fans, it allows me to be absolutely honest. Yet I know I would be very good at promoting for a race sponsor or team, I can easily see lots of possibilities. I spend many hours doing what I do and anguish over the details realizing I am influencing someone's vacation. I take it seriously while having fun, so it can be fun for you. When someone asks me if I am a volunteer, I always answer, yes I am a volunteer even though I don't wear one of those yellow or blue tshirts. Quality of information is really important to me as well as creating a sense of cycling community for visiting fans. "Mom, can we come back again next year?" overheard from a small boy in Denver Civic Center Park yesterday. Sorry, he was too young to drink beer with us. And mine, of course - the photo I captured of Alex Howes after the finish line, lit up Twitter last Sunday night. 7. Super nice support staff (marshals, moto drivers, official volunteers, media car drivers Terry & Steve, the Mavic support crew, Jamie the Mobile PA, and Marcel van Garderen!) We need a much bigger table! What is next for moi? I haven't a clue. I think I might remove the batteries from my computers mouse and follow Jens on his plan to lead Trek Travel Tours in Solvang, California. I think we'd make a good combo, even if we are as different as chalk and cheese, we both love travel and cycling fans. And we both appreciate the difference in others. I was blown away with Jensie's openness and graciousness with the fans - he is genuine. He is the real deal and I will miss him greatly (until we lead our next tour together that is). 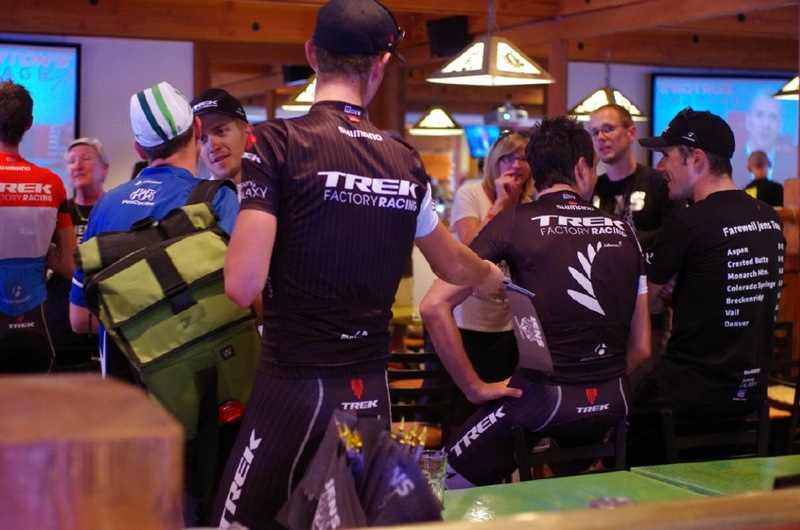 Yes, Jens definitely needs to join us for a beer! Thank you for sending my labradoodle Jack Denny well wishes. Jack is recovering well from his cancer surgery. He was with me for four days in Aspen before we returned home. In the end I got to attend much of the race due to help form two different home dog walking/care services. Jack is healing and doing well. Thank you! And watch the Vuelta a España - it's on now. SteehillTV all the links and coverage. I missed meeting Cosmo from Cyclocosm, I really like his stuff, I think he changed his hair and I wasn't expecting the beard. Remember in 2012 when I missed Mario Cipollini in the VIP tent in Denver? Ya, this was kind of the same. I didn't buy any Jens apparel. But I did get a really cool mug and Trek musette bag at the Trek Fan Club Meeting in Aspen. I'd also like a do over on the spectacular crash to the ground I took while running along the barriers in the rain on Vail Pass. Apparently the Orange Guy fencing did not take down Alex Howes but it sure as heck took down me, and broke my lens extension thingy (that's a technical term for lens hood), and gave me an unusual dent in my left elbow. It's probably a tumor. Okay, thanks for a fun week. See you in November, in Solvang, with Jens.